I easily took more pictures on Dominica than on any of the other 5 islands we visited on our cruise. The only type of shot I wanted to get that I failed in securing on the island was a shot of one of the locals doing some everyday task that had nothing to do with catering to we tourists. I almost captured a picture of two men tying up their goat, but I was a few seconds too late. 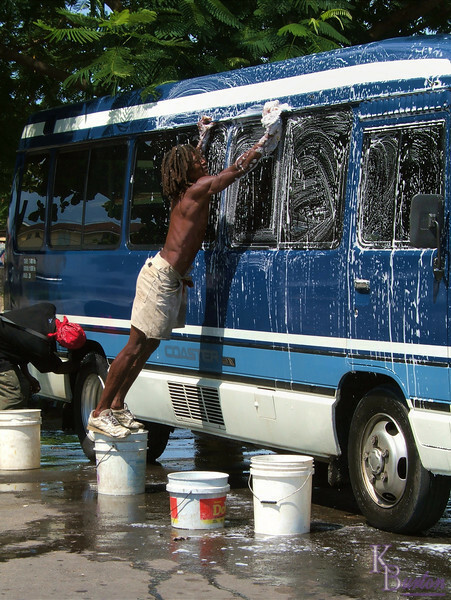 Turns out these two guys cleaning their tour bus was the best I could do. It wasn't a well aged woman deftly weaving a basket, but I had to admit, it was still a pretty good shot none the less. This is a great picture. I love the colors and the use of space. Very cool shot. Excellent composition, great colours, well exposed. Perfect description of the image, I wish more photographers would do the description 1/4 as well as you! Did the guy fall down. He should have put the bucket even further apart.